cADI PSF-subtracted images of HD 131399 Ab obtained with GPI in 2017 in J (top left), H (top right and bottom left), and K1 (bottom right) bands. A two-pixel lowpass filter was applied on the images to suppress shot noise. Intensity scales are linear, different in each image, and chosen to saturate the PSF of HD 131399 Ab. The central star is masked numerically, and its position is marked by the white cross. Credit: Nielsen et al., 2017. (Phys.org)—A new study conducted by an international team of astronomers suggests that a recently discovered alien world, designated HD 131399 Ab, may not be a planet at all, but rather a background star. The researchers presented evidence supporting their hypothesis in a paper published online May 19 on the arXiv pre-print repository. HD 131399 Ab was discovered in July 2016 using the SPHERE imager of the Very Large Telescope at the European Southern Observatory (ESO) in Chile. Located some 316 light years away from the Earth, the object was initially classified as an exoplanet orbiting its parent star HD 131399 A every 550 years at a distance of about 80 AU from the host. The star is part of the triple system HD 131399 in the constellation Centaurus. A reanalysis of the available data from SPHERE, as well as new photometric and spectroscopic observations carried out with the use of two other instruments, has led the researchers to call into question our current knowledge about HD 131399 Ab. The team led by Eric Nielsen of the SETI Institute, reinvestigated this object using the Gemini Planet Imager (GPI) installed on the Gemini South Telescope in Chile, the NIRC2 near-infrared imager mounted on the Keck II telescope in Hawaii and also the SPHERE instrument to derive colors, spectra, and astrometry for HD 131399 Ab. "The analysis of the data reveals unexpected spectroscopic and astrometric results that motivated the reanalysis of some of the already published data obtained with VLT/SPHERE," the astronomers wrote in the paper. After its detection, HD 131399 Ab was classified as a young and massive planet. The astronomers discovered that HD 131399 Ab is about 16 million years old and has the mass of approximately four Jupiter masses. The new study, based on the data collected in 2017, presents the hypothesis that the object is a K or M dwarf star. By analyzing the escape velocity of HD 131399 Ab, the researchers ruled out the possibility that the object is a bound planet. According to the authors of the paper, the probability that HD 131399 Ab is a background object is about 43,000 times greater than the probability that it is a bound planet. The team also excluded other hypotheses such as the possibility that HD 131399 Ab is a planet or a planetary-mass object in the process of ejection from the system. "We note this is very unlikely a priori, since the chance of observing a 16 Myr star just as it is ejecting its planet is very low," the researchers wrote. According to the team, the most plausible hypothesis is that HD 131399 Ab is a background star. They found that spectra and magnitudes of the object obtained by GPI and the revised data from SPHERE are mostly consistent with a K or a M dwarf, the most probable candidates for a background object. "When compared to predicted background objects drawn from a galactic model, we find this proper motion to be high, but consistent with the top 4 percent fastest-moving background stars. From our analysis, we conclude that HD 131399 Ab is a background K or M dwarf," the authors concluded. 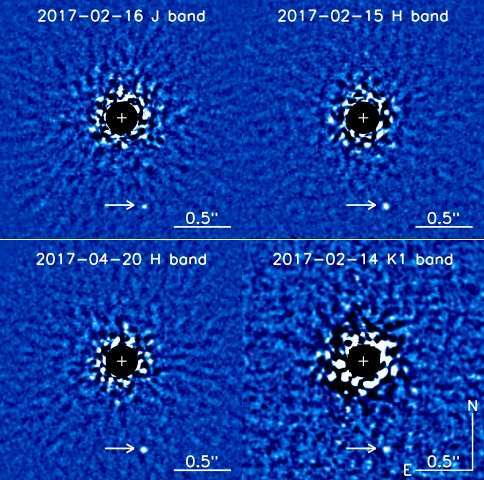 We present evidence that the recently discovered, directly-imaged planet HD 131399 Ab is a background star with non-zero proper motion. From new JHK1L' photometry and spectroscopy obtained with the Gemini Planet Imager, VLT/SPHERE, and Keck/NIRC2, and a reanalysis of the discovery data obtained with VLT/SPHERE, we derive colors, spectra, and astrometry for HD 131399 Ab. The broader wavelength coverage and higher data quality allow us to re-investigate its status. Its near-infrared spectral energy distribution excludes spectral types later than L0 and is consistent with a K or M dwarf, which are the most likely candidates for a background object in this direction at the apparent magnitude observed. If it were a physically associated object, the projected velocity of HD 131399 Ab would exceed escape velocity given the mass and distance to HD 131399 A. We show that HD 131399 Ab is also not following the expected track for a stationary background star at infinite distance. Solving for the proper motion and parallax required to explain the relative motion of HD 131399 Ab, we find a proper motion of 12.3 mas/yr. When compared to predicted background objects drawn from a galactic model, we find this proper motion to be high, but consistent with the top 4% fastest-moving background stars. From our analysis we conclude that HD 131399 Ab is a background K or M dwarf. No, This is data-driven. It is Real Science. Exactly - real science makes hypotheses and tests them, and corrects them if needed when new data comes in. Science may not always work properly, but this is an example of how it should work. The two sides can now discuss whether it is more likely to be a planet that just happens to be caught being ejected or a fast background star that just happens to be where a planet might be expected, and then someone will make the effort to get better data and settle it, or someone will think of an even better explanation.